A good number of reviewers love the cool and clean look of the Adidas Ace 17.3 Firm Ground cleats. Majority of those who purchased football boots from Adidas raved about how good the quality was specifically this shoe. Some players found this boot comparable to Adidas Predator 19+ Firm Ground when it comes to its excellence in dribbling and passing. Considering the boot's quality and affordability, many buyers said it was a good value for money. A couple of wearers commented that the Ace 17.3 was very suitable training boots. To most testers, the Prime Mesh material offered a comfortable, sock-like fit. Some were thrilled about the free printing option to personalize the soccer shoe. A few users commended the boot's good traction and lightweight feel. Some users felt that the heel cushion was too stiff and caused much pressure on the heel. A few complained of getting blisters after trying out the boot. Some players observed that the boot took some time to break in. To a few reviewers, some football boots for firm ground surfaces, as such felt narrow and a bit tight when worn. The lack of ankle support caused the boot to slip out easily, said some testers. Although the personalization was a cool feature, some were disappointed that it easily came off. While being the more budget-friendly option, the Ace 17.3 Firm Ground (FG) does not fail to impress with a striking look that evenly matches its predecessors. With the boot's lightweight construction and good traction, players won't just look great but also give a solid performance. Fit might not necessarily be this boot's best asset, but it still is a good buy if you desire that Adidas Ace experience at a minimal cost. In regards to the material and just the overall quality of the upper, it's better than what I was expecting. Similar to its lower tier predecessors, the Adidas Ace 17.3 Firm Ground utilizes PrimeMesh in its upper. Although it almost looks identical with the Ace 17.2, the 17.3 model made a few tweaks in its upper configuration. Combining the PrimeMesh with synthetic neoprene material, the football boot aims to provide that sock-like fit and that superior touch that allows for great ball control. Another feature of the football boot is its Primecut silhouette, which is specifically designed to provide a streamlined fit around the ankle. This version of the Adidas Ace 17 allows players to test out how this style of collared boots performs without necessarily breaking the bank. The boot's outsole is configured with the Total Control alignment to give players the stability and traction they need to power up their play. These studs work impressively on firm ground as well as on artificial grass, allowing for efficient, high-speed plays. 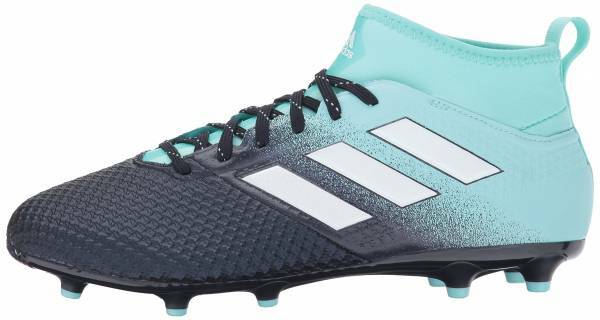 Adidas Ace 17.3 comes in the standard boot sizes for men and women. The width of the boot, however, runs narrow, so it may not be the best option for those with wider feet. Given its PrimeMesh and neoprene composition for the upper, users can expect a tight, sock-like fit when these boots are worn. The outsole of the Ace 17.3 Firm Ground is molded with the Total Control stud design. This type of outsole is the first to have a mixed Firm Ground (FG) / Artificial Ground (AG) configuration that is set with a lower stud height to enable more studs to touch the ball when handling. With this kind of stud alignment, the boots achieve superior stability, high-speed control, and traction on firm ground pitches. The football boot wears an innovative hybrid upper that integrates PrimeMesh and neoprene. PrimeMesh lines the front foot area while neoprene covers the rest of the foot, including the collar. This arrangement enables the material to perfectly wrap the foot, giving that sock like sensation and adaptable support, especially at top speed plays. The all-synthetic upper is also textured, providing a clean touch and impressive ball control that will allow players to dominate on firm grounds. It has also been treated with an ultra-thin film that works to protect the boot and keep water and debris out. A free printing option is made available for buyers to allow personalization of the boot. This football boot is also available in turf (Adidas Ace Tango 17.3 Turf) and indoor (Adidas Ace Tango 17.3 Indoor) versions.